IMTEX Forming 2018, organised by Indian Machine Tool Manufacturers’ Association (IMTMA) concurrently with Tooltech, concluded on a positive note with business orders worth Rs 539 crore being generated during the six-day trade fair. The exhibition, which was held at Bangalore International Exhibition Centre (BIEC) from January 25-30, 2018 and witnessed participation of 504 exhibitors, showcased future technologies that could be vital for enhancing productivity for Indian manufacturing industry. Exhibitors displayed wide range of high-end presses, laser cutting machines, and technologies related to bending and tube drawing. Advanced technologies such as Industry 4.0 and Internet of Things (IoT) were also displayed by many exhibitors. Automation, robotics, sensors, CAD/CAM and tools that were more related to support the metal forming user industries were also displayed. International associations from Germany, Italy, Japan, Taiwan, UK and USA also participated in the exhibition. Parallel events also recorded good visitor turnouts. 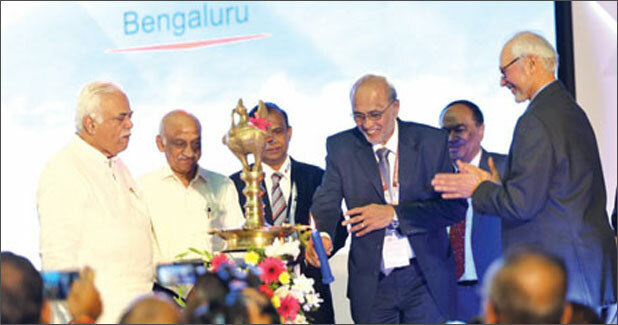 Over 350 participants from 130 companies participated in the international seminar on forming technology held on January 24, 2018 at BIEC, Bengaluru. Twenty-one delegates from seven countries took part in the international buyer-seller meet held from January 27-28, 2018. More than 2000 students from over 50 institutions took part in ‘i Connect’ to enrich themselves with opportunities in store for them in the manufacturing sector. Delegations from public and private sectors representing user industries such as auto components, aerospace, defence, railways, electrical and electronics, plastic machinery, white and brown goods, medical engineering, and others took part in the show. IMTEX Forming 2018 served to open up the way for development of Indian metal forming sector by acting as an enabler to forging long-term business relationships which could lead to the growth of the country’s economy.